Determined to improve their defense, the Chargers traded up in the 1986 NFL draft to take O’Neal in the first round (8th overall). He was a two-time All-American in college and moved quickly into the starting lineup where he performed extremely well until a knee injury in the 13th game knocked him out for the rest of the year. Chargers went 4-12 to finish fifth in the AFC West while tying for second in the NFL in sacks (62). The severe knee injury suffered late in his rookie season cost him all of 1987 and the first half of ’88. By 1989 he was a Pro Bowl performer, listed as an outside linebacker but often lining up as a down lineman while showing skill in dropping back into pass coverage. He registered 12.5 sacks and another 13.5 in 1990 as he again received Pro Bowl recognition. A smart and savvy player on the field, he took criticism for his attitude off of it. Following a lesser year in 1991, O’Neal was moved back to defensive end in ’92 and compiled a career-high 17 sacks as he again received Pro Bowl recognition. It was the first of four straight Pro Bowl years as he solidified his reputation as one of the NFL’s top pass rushers while registering 54 sacks. 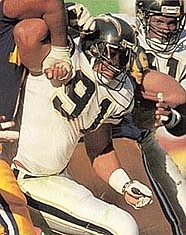 O’Neal left the Chargers as the club’s all-time sack leader with 105.5 and joined the St. Louis Rams in 1996. After two disappointing seasons in St. Louis, he moved on to the Chiefs for the final two years of his career. Overall, O’Neal had 132.5 sacks, which ranked sixth all-time at the time, and was chosen to the Pro Bowl on six occasions.